Growing up my mamma used to make this amazing banana bread bundt cake. It’s far from being a traditional Lebanese recipe and she literally invented it one day out of the need to use up some overripe bananas and it was so over the top amazing that it made it on to her weekly rotation. She would purposely overbuy bananas and as the end of the week neared and they ripened she would make the cake. If you know bananas then you know their flavour is intense, and even more so as they ripen, giving so much depth of banana flavour to the cake, which is awesome for banana lovers. As I grew up my diet evolved. I first gave up meat, then I started reading up on health and nutrition information and as I learned just how many horrible unhealthy calories were in a Tim Horton’s banana muffin or Swiss Chalets carrot cake, both childhood favourites of mine growing up in Canada, I stopped eating them and became really conscious about these masquerading as healthy treats. In fact I stopped eating sweets altogether and convinced myself I didn’t like sweets, with the exception of mama’s banana bread bundt cake. 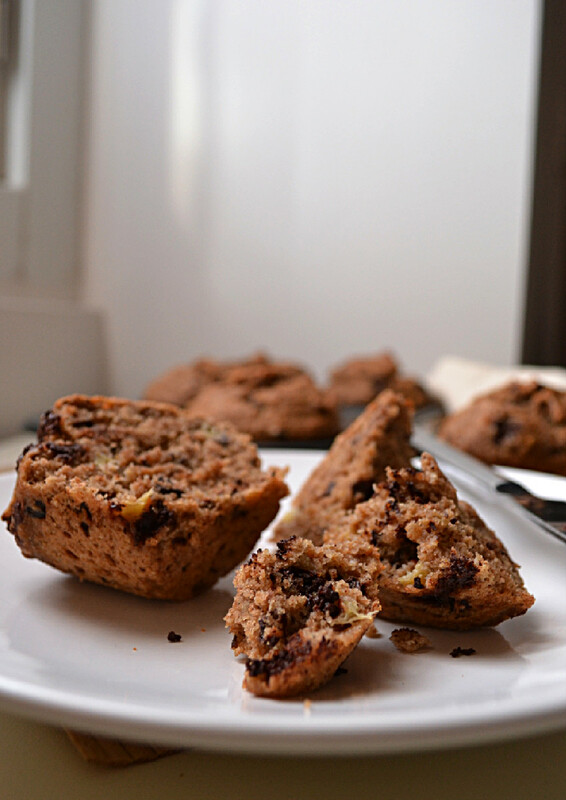 A few years later I discovered the Babycakes cookbook, “Vegan, (mostly) Gluten-Free, (mostly) Sugar-Free recipes from New York’s Most Talked About Bakery” and one of the first recipes I mastered from that book was the Banana Chocolate Chip Bread. It was magical and reminded me just how much I enjoyed sweets. Whenever I felt like having something sweet, it became my go to recipe. At first, I would make it exactly as the recipe called for and overtime I started experimenting and subbing and the recipe evolved into something completely different. I abandoned the gluten free part, as it wasn’t necessary for me, which means I also adapted the recipe to exclude gums. I started using whole wheat flour, reduced the oil and added in apple sauce. The recipe evolved some more as my nutritional knowledge grew and this here is the final result, an oil free banana chocolate chunk bread/cake/muffin recipe using whole spelt flour, tahini and apple sauce instead of oil and completely sweetened with maple syrup instead of the agave used in the book. In fact the recipe has changed so much, it’s not even recognizable anymore, but I do have to credit Erin McKenna for introducing me to the ways of vegan baking. On a last note, I’m sure the recipe would work with a solid gluten free flour blend as well, with some added xanthan gum or a chia egg for binding power, but I haven’t tried it out. 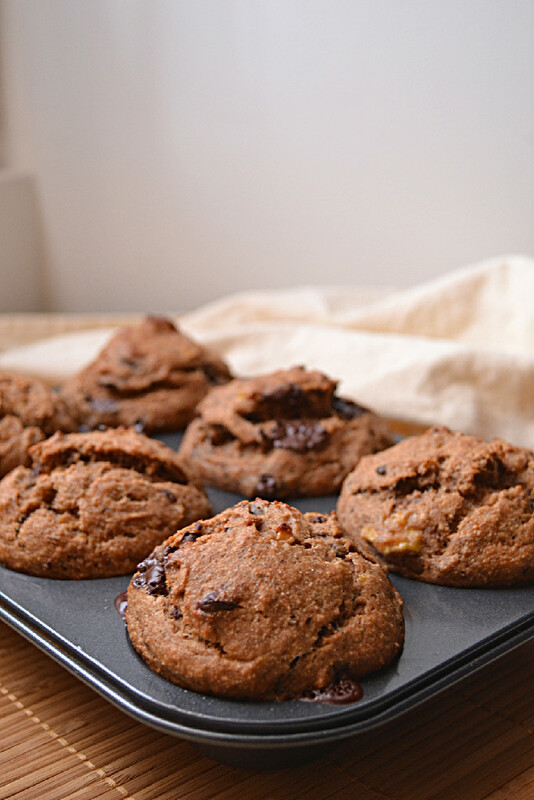 These muffins are certainly a treat, but “healthy enough” to be included in breakfast if you’re pressed for time and need to grab something on the run. The main here is the banana, a sweet and creamy fruit that needs no introduction. Besides being incredibly tasty and versatile in their use, bananas are a great source of fiber and many important vitamins and minerals, most specifically Vitamin B6 and C, postassium and manganese. Banana’s have an array of health benefits. They help maintain normal blood pressure and heart function, protect against atherosclerosis and heart disease and help block the absorption of dietary cholesterol due to their high postassium, sterol and soluble fiber content. Bananas are also a prebiotic, feeding the good bacteria in the colon, they help regulate blood sugar, provide energy, and aid digestion. They are also a natural antacid and provide relief for heart burn and stomach ulcers. Grease muffin pan with coconut oil and pre heat oven to 180 celsius. Sift flour and combine with all dry ingredients. Form a well in the centre of the dry ingredients. Whisk together wet ingredients, including mashed bananas, but NOT the apple cider vinegar. Pour wet ingredients into the well in the centre of the dry ingredients and mix with a spatula until well combined and smooth without clumps. Do not over mix. Fold in apple cider vinegar, cacao nibs and chocolate chunks. Poor batter into muffin tins. Bake on center rack for about 20 min. Total bake time may vary based on the oven. Do not open the oven to check the cake until it has risen completely (approx 18-20 min). Check the centers with a toothpick, if it comes out clean, they are ready. If the toothpick comes out sticky and more time is needed return them to oven for another 5-7 min. Thanks Audrey, they really combined magically in this recipe. I was so pleased with how fluffy and moist they turned out. I think you could make them work with a good GF flour blend. Let me know if you try, I’m sure some of my readers would love to have the alternative. As you know, these muffins were amazing Nissrine! I tagged you on Instagram with my photo and my own little twist since I don’t like bananas, lol! I made them more tahini-focused. My daughter and I gobbled them all up in record time. They were probably the hugest fluffiest muffins I’ve ever made, so good! Thank you so much for the recipe and inspiration! I’m so happy you and your daughter enjoyed them Brandi. Thanks so much for the great feedback. I saw the Instagram, they look fantastic and your adaptations sound amazing too. Made these for breakfast and my daughter and I loved them! Thank you very much! That’s fantastic Hope. I’m so happy to hear you and your daughter enjoyed them. Have a lovely day. I’ve just made them. They are heavenly, couldn’t stop eating. So glad you enjoyed them Enna. Same thing happens to me when I make them. 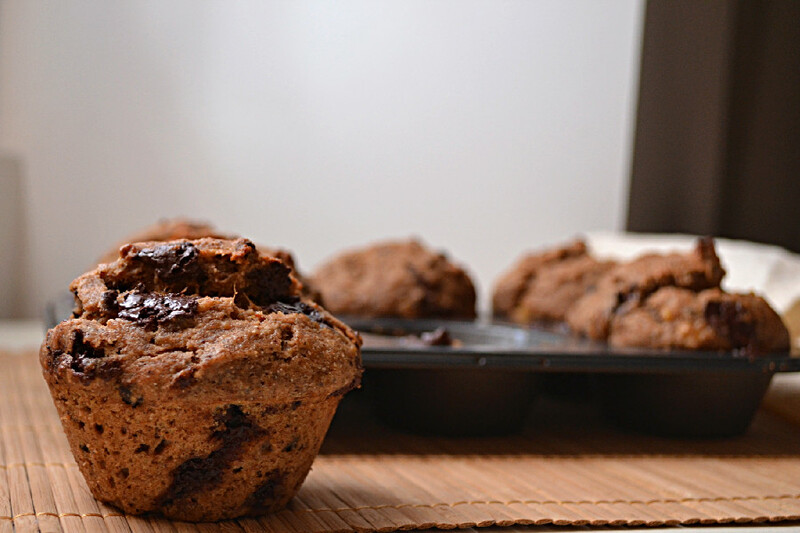 Made these muffins this afternoon and they are utterly scrumptious! I added a handful of dried cranberries to the batch and a piece of sliced banana on top of each muffin. Mine took 42 minutes to bake through for some reason but they are perfect! Moist, just the right amount of sweetness, and a wonderful snack. My roommates and I are thoroughly enjoying them. I’ll be making another batch soon!